"Amidst more than a million citizens of Bombay [now Mumbai], there existed, in the thick of the City, in the year 1922, a microscopic group of about two scores of peculiar people who were, at the same time, more than a million miles away from it. So opens the description of Avatar Meher Baba's life and work at Manzil-e-Meem, as described in the 1936 issue of the Meher Baba Journal. Manzil-e-Meem was the Bombay residence Meher Baba used for His work with His close disciples (mandali) for about 10 months from 1922 to 1923. Generally translated, the term Manzil-e-Meem means "the House of the Master." 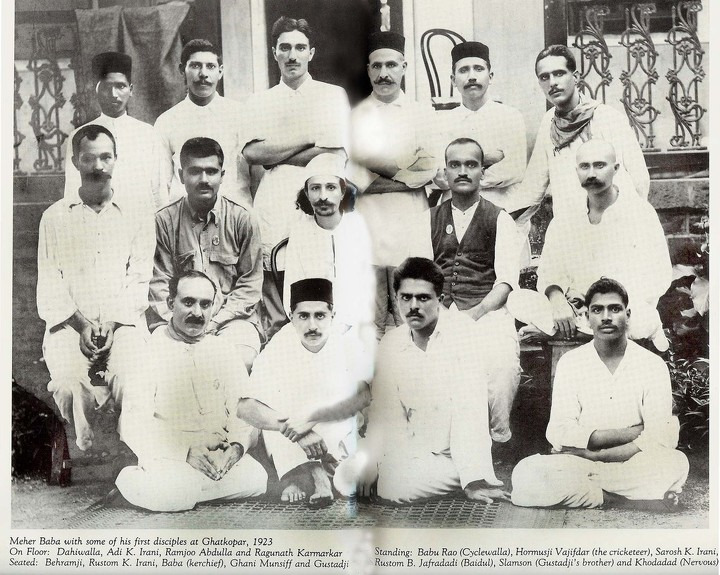 AVATAR MEHER BABA in 1922 during the Manzil-e-Meem days. Opinions were solicited, and they had their own little parliament which was called the gutta (a wine shop). "To avoid the gutta [wine shop, tavern] getting as noisy as a gutta is in its literal sense, they could speak only one at a time after obtaining permission of the 'chair' squatting amongst them on the same carpet. The focus of the event is a discussion of Meher Baba's life and words. For the Gutta Breakfast events at Meher Mount (December 8, 2012, September 14, 2013, and October 11, 2014), Fred selected passages to read aloud from Lord Meher, the multi-volume biography of Meher Baba by Bhau Kalchuri. Each person who was interested read the designated passage, and then all were welcomed to comment and ask questions. The discussion followed the guidelines of the original gutta - all were free to speak and share their thoughts and opinions. For the "breakfast" part, Fred and former Meher Mount Board member Gigi Driessen provided delicious breakfast treats. "Manzil-E-Meem," by Abdul Kareen Abdulla, Meher Baba Journal, Vol. 1, No. 6, April 1939, pages 26-30. Copyright (c) 2011 Avatar Meher Baba Perpetual Public Charitable Trust, Ahmednagar, India. Meher Prabhu: Lord Meher, The Biography of the Avatar of the Age, Meher Baba, by Bhau Kalchuri, "Manifestation, Inc.", 1986, pp. 465 and 499. Copyright (c) Avatar Meher Baba Perpetual Public Trust.